What is E-Z Breathe® and How Does it Work? E·Z Breathe® works by air exchange. Simply stated, it exhausts stale air and all the contaminants and moisture that come with it. Even though it is installed in one room, E·Z Breathe® achieves whole home air changes, by drawing air throughout the home to replace the stale air being exhausted. The E-Z Breathe® System is a maintenance free unit that helps protect your home and family from excess moisture, molds, toxins, allergies and poor air quality resulting in a cleaner, healthier living environment. It provides powerful ventilation, supporting both the EPA and the American Lung Associations’ recommendations to use a ventilated system to reduce indoor air pollution. It not only reduces indoor air pollution, it also expels odors, moisture and damp cold contaminated air from your home. By exchanging this stale air for fresh air, the atmosphere within the home becomes healthier and safer. Removing this excess moisture also helps prevent damage to your home’s structure and personal belongings. E·Z Breathe® is the ultimate dehumidifier, air purifier, and ventilation system at half the cost of ownership with no on-going maintenance responsibilities. A major component of taking care of your home is to make certain that there is proper ventilation. 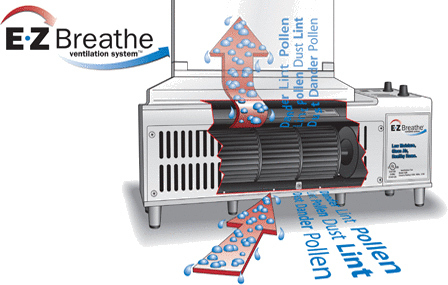 E-Z Breathe helps to create a healthier environment in your by removing excess moisture. Odors within a home not only cause discomfort, but can also be the result of bigger problems. Mold poses a major health risk to you & your family. E-Z Breathe helps to minimize that risk in your home.